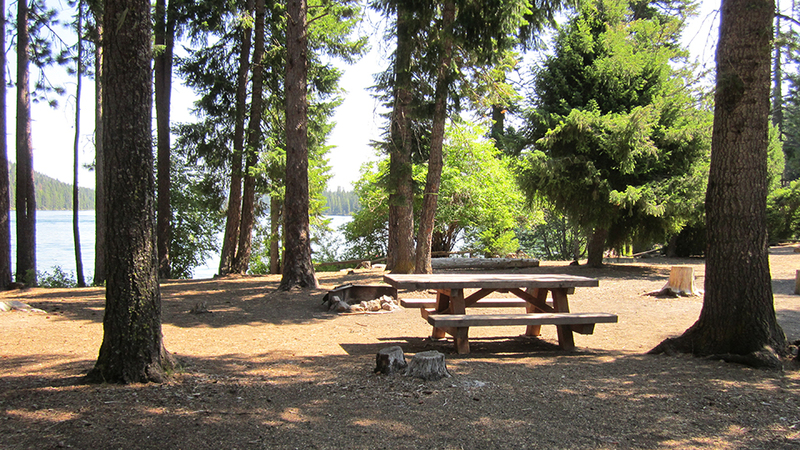 Link Creek Campground is situated on the shores of Suttle Lake in the Deschutes National Forest. Visitors enjoy boating, fishing, hiking and horseback riding in summer, and cross-country skiing and snowshoeing in winter. Deep, clear Suttle Lake is surrounded by a mixed conifer forest and sustains an excellent population of naturally reproducing kokanee, brown trout, whitefish, and crayfish. A boat ramp is located within the campground. Motorized and non-motorized boats are allowed on Suttle Lake. Link Creek Campground offers tent and RV campsites, as well as yurts. Campsites are equipped with tables and campfire rings with grills. Vault toilets and drinking water are provided. While the campsites are pet-friendly, unfortunately pets are not permitted within the yurts. The yurts are available for reservation year-round. Each is equipped with a bunkbed with one double and one single mattress, double futon, table and chairs and a wood stove. Visitors need to bring their own linens, lantern and eating essentials. No electricity is available. Link Creek, which empties into Suttle Lake, is shallow and clear enough to view spawning fish. Numerous hiking and horseback riding trails are accessible from the campground and in the surrounding area. The 3.2 mile Suttle Lake Loop Trail meanders through the developed recreation areas on Suttle Lake. The trail is relatively flat and follows the wooded shoreline of the lake, providing opportunities for fishing or picnicking along the way.